When I lived on Cape Cod, an off-and-on adventure beginning in my 20s, summer started out as beach-and- party season and wound up as dodge-the-tourists season. Nowadays it’s my annual chance to see the latest show at the Edward Gorey House, maybe throw a book-launch party, and catch up with old friends. I love living in San Francisco: unlike the East Coast, the winters don’t turn my lips blue or my toes white, and the summers don’t turn my face, arms, and shoulders painfully red. 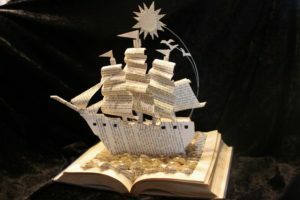 But when it comes to books and theater, star-filled skies, sea-scented air, birds and plants I’ve known since childhood, and leisurely conversations that are both wise and witty, I love returning to the Cape. This year I happen to be writing a new Edgar Rowdey Cape Cod mystery novella called The Toastrack Enigma which parallels the Edward Gorey House’s art show, Murder He Wrote. The novella is a homage to Edward’s and my shared pash for Agatha Christie, manifested in my favorite of his books, The Awdrey-Gore Legacy. It’s also a homage to Edward’s penchant for torquing traditional forms, in that the plot veers from an ordinary day at the village diner-cafe into the briar patch of real-estate development and Indian land disputes. (Can you believe that this very week, a Congressional committee is once again debating the Mashpee Wampanoags’ legal status as a tribe?) 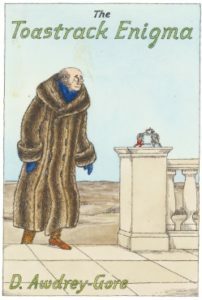 And then I’m working with the Edward Gorey Charitable Trust to shepherd Edward’s theatrical creations — both pictorial and poetical — into print, a project that involves vigorous reminiscing with some of the players who gave them 3-D life. If you’re on the Cape between Friday, Aug. 2 and Thursday, Aug. 9, please come say hi at one of these events. Free admission, refreshments, good books and good conversation! Click on a red link for details. Sturgis Library, Barnstable Village, 10:30-12:30 Sat. Aug. 4 Come check out my books, and/or have one autographed for you or a friend — and fill your beach bag at the library’s annual book sale! 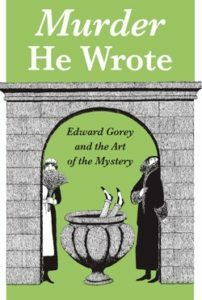 Falmouth Public Library, 6:30 PM Tues. Aug. 7 Recalling on- and offstage escapades with fellow Gorey troupe member & FPL librarian Jill Erickson — plus a reading from Zapped: An Edgar Rowdey Cape Cod Mystery, and of an Edward Gorey mini-mystery! Edward Gorey House, 8 Strawberry Lane, YarmouthPort, 6:30 PM Wed. Aug. 8 Why did Edward Gorey choose the mystery form, and what unique twists did he put on it? See this year’s show, “Murder He Wrote,” enjoy a glass of wine, and hear a scene from my Edgar Rowdey Cape Cod Mystery in progress, The Toastrack Enigma. For more info, call the Edward Gorey House at 508-362-3909 or visit their Facebook event page.